Porsche is extending the GTS principle to the Boxster and Cayman for the first time ever. These mid-engine sports models from Porsche feature uprated engines and Porsche Active Suspension Management (PASM) chassis. 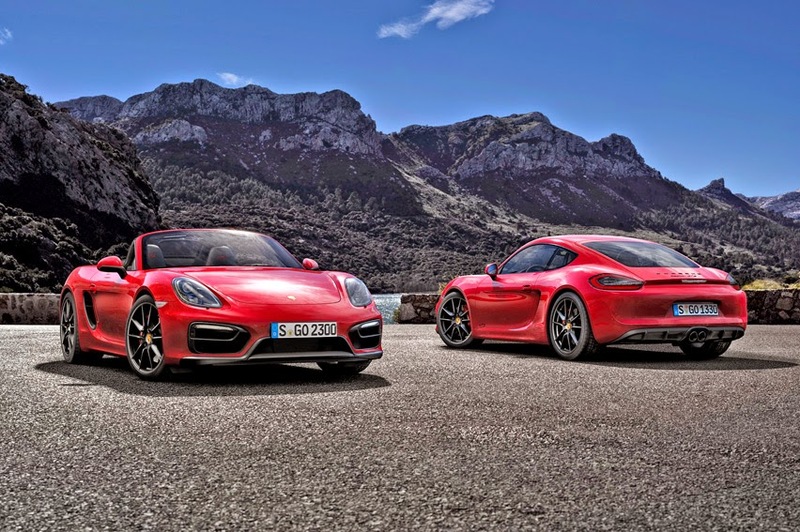 engines fitted are based on the 3.4-litre units from the Boxster S and Cayman S. Due to fine-tuning they deliver an additional 15 hp: the Boxster GTS now has an output of 330 hp, while the Cayman GTS delivers 340 hp. Torque increases by ten newton metres in each model. Additionally, the Sport Chrono package is standard. In conjunction with the standard Porsche Doppelkupplung (PDK) gearbox and Sport Plus mode, this translates into sprints from 0-100 km/h in 4.7 seconds for the Boxster GTS, with the Cayman GTS a tenth of a second faster. The Boxster GTS's top speed is 279 km/h, while the Cayman GTS is even faster at 283 km/h. The new top models achieve an overall fuel consumption of 8.2 l/100 km according to the New European Driving Cycle. "With the introduction of the GTS versions of the Boxster and Cayman, we are catering to Porsche purists and true sports car enthusiasts in the country. These two new Porsche sports cars excel visually and dynamically, and assure a rewarding ownership and driving experience," said Anil Reddi, Director, Porsche India. The Boxster GTS and Cayman GTS feature PASM as standard which offers the driver a choice of sportier or more comfortable settings at the press of a button. The tyres measuring 235/35 at the front and 265/35 at the rear on 20-inch Carrera S wheels provide the perfect setup. Like other Porsche GTS models, both two-seaters come with standard sports seats and leather interiors enhanced with Alcantara elements. The distinctive front and modified rear end, blackened bi-xenon headlights - with Porsche Dynamic Light System (PDLS) – and taillights as well as silky black gloss exterior lettering are subtle yet unmistakable features of these new models. The new Boxster and Cayman GTS models are available for order at Porsche dealerships across India.